By the very nature of being old, a vintage steamer trunk is going to need some upkeep. Unfortunately, some of the things that can break with antique trunks are their locks. It comes down to what you are trying to avoid and what type of lock you are using. 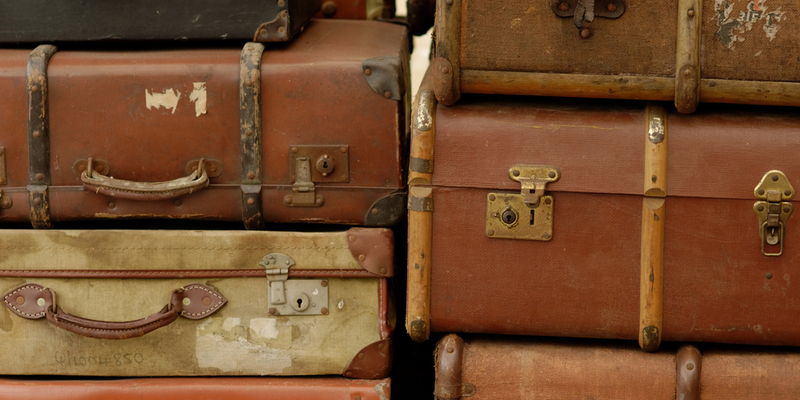 Here is what you need to know to open your vintage steamer trunk. Before being able to open your steamer trunk, it is important to know what type of locking mechanism you are interacting with. This will influence the manner you approach opening antique trunks. If you look back at the history of security, specifically the history of padlocks, you can see how the warded lock design gained popularity. When people picture an old key, they often envision something like a warded lock key. Though the keyway and keys themselves can be easily confused for those of a Lever lock, antique trunks are almost never going to have lever designs. In terms of manufacturing, it was significantly more simple to make a warded lock than a lever lock. But that is good news for you if you are locked out of your antique chest because a warded lock is not very complex at all. Essentially you only need to navigate around some internal warding to retracting the locking pawls. Warded lock keys have very rectangular grooves and are often have a rounded shaft. Common keys for the warded locks that are a part of the antique trunk hardware are as good as flat with rectangular cuts. The keyways are very open. (When you look inside the keyhole you will not see any pins, wafters, etc.). The keyway could also be largely taken up by a cylindrical used to orient the key (which will have a corresponding hole in its shaft). Opening Warded Locks – To pick open a warded lock, go around the warding and go straight to the locking mechanism. There are special warded lock picks (they come in a few profiles), and between them, they will open any lock. These are skeleton keys that only need to be twisted in the keyway in order to effectively open the lock. Essentially, with any warded key, most of the notches only exist to keep the key from getting past the interior wards. It will only be the last, or the last and second to last, grooves that actually interact with the locking mechanism. So if you fill down the key so only the last one or two notches are sticking out, you can get around the locks security. If you don’t want to invest in some warded picks, opening the locks that come with the antique trunk hardware, they come in a few profiles. Warded padlocks, however, will need skeleton keys. Not many antique chest locks use a pin tumbler design, but in the case of some padlocks (old and new), you will be dealing with this common lock type. It is rare for true antique trunks to use pin tumbler lock designs on their inset locks. However, you might find a modern steamer trunk that has been dressed up to look like an antique chest or find that some of the original antique trunk hardware has been replaced. A pin tumbler design is going to be more difficult to open than a warded lock, but it is unlikely that you will be dealing with something too complicated. Unless the last person to use the vintage steamer trunk was using one of the best padlocks on the market, opening the lock will be relatively simple (relative to how difficult it could be). You will still need to know how to pick locks, but they are unlikely to be difficult to pick. If you have access to the key, you will see dips and grooves down the blade until the shoulder of the key (which prevents the key from over inserting). You can look through the keyhole and see there are pins inside. (You might need to direct a light source). Most often you will see this type of lock as a padlock. Opening Pin Tumbler Locks – If you are going to open a pin tumbler lock, you have to know how to pick locks. With no real experience, opening up the pin tumbler locks on a steamer trunk can be next to impossible. In terms of raking vs. single pin picking, anyone trying to open antique trunks on a lark should stick to raking. It is a simpler method that only requires the right lock picking tools for beginners in order to successfully open a lock with minimal training and practice. The trick to opening pin tumbler locks are using a lock pick and a tension wrench. Opposed to opening a warded lock, which only requires only the single skeleton key. It also takes more luck or skill. It is unlikely that you will be able to get any type of master key, let alone skeleton key, for the pin tumbler lock on your steamer trunk. Unless the vintage trunk uses a new padlock, such as one of the TSA approved lock, you might be able to find something specific to that lock online. The thing about an antique chest is that its main appeal is its antique quality. With a steamer trunk that is a faux antique, you might be fine sacrificing the lock, but in most cases, you are not going to want to damage the lock on your vintage steamer trunk. However, if you are not able to get your lock open with the methods mentioned above, and are unable or unwilling to call a locksmith, you might need to sacrifice the lock. This might also be necessary if the lock is broken. Opening Steamer Trunk Padlocks – Getting the padlock on an antique chest open by sacrificing the lock means you are most likely going to cut it off the hasp. In terms of vintage steamer trunk padlocks, they will not have enough room on the hasp to secure a truly high-security padlock. Most often you can just use a pair of bolt cutters so only the padlock is damaged. The vintage steamer trunk will not be damaged. You can still use another antique padlock and keep the same level of authenticity. If you try to twist or torque the padlock, you could damage the actual steamer trunk hardware. The twisting is likely to snap the hasp off your trunk before the padlock. After this process, you might still need to deal with an inset lock that you don’t have a key for. Opening Steamer Trunk Inset Locks – The only reason you should break the inset lock on your vintage steamer trunk is if the lock is broken. 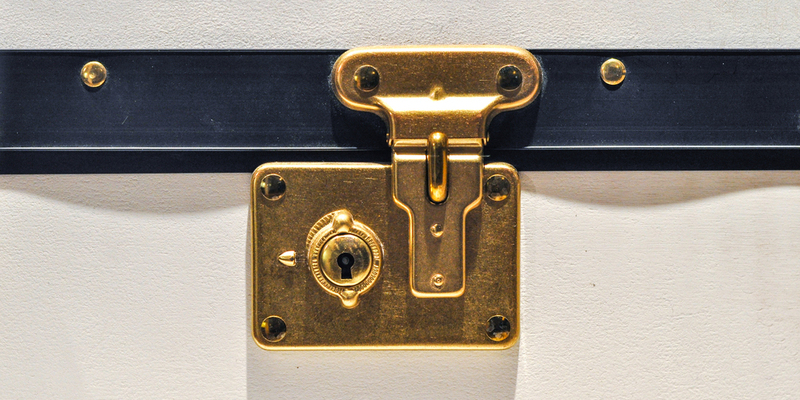 Chances are the antique trunk hardware is going to mean that your steamer trunk’s inset lock is going to be warded. Warded locks rarely break. They are made to resist hard weather, dust, dirt, etc. So it is unlikely that this type of lock will break. But you still might need to open the chest quickly for some reason and not have the time to experiment with, and need to break the lock open. Be careful when you are trying to pry the lock open because a pry bar or flat head screwdriver might dig into the material of the steamer trunk. If you are trying to open a wooden trunk, you might damage the trunk. Keep your attacks to steamer trunk hardware and do not apply pressure or force to the walls of the steamer trunk itself. If you have the materials, the skill, and the information you need to make keys yourself, it is not all that risky to they come in a few profiles. But you can always enlist the help of a locksmith for this type of work. You just need to find the right locksmith. Many modern locksmiths are glorified lock openers and have lost touch with the “smith” nature of the profession. Make sure your locksmith know their way around making keys on a key cutter and understands the mechanics of your antique trunk locks. With or without a trace of a key, the right locksmith can make a new key. Yes, a locksmith can more easily copy a broken key, but they can also use the existing lock. In the case of warded locks, they can even use an existing skeleton key profile to base a new key design off of. When you know you need a locksmith to make a new key for your vintage steamer trunk, start calling around to your local locksmiths inquiring about that type of service. If a company does do that type of work (making replacement keys for antique locks), they should have no problem dealing with making keys for a vintage steamer trunk. As long as you know what type of lock your antique trunk hardware uses, you can figure out how to deal with it. Identify the lock and then open it. Whether you want to protect the lock or are fine with sacrificing it, you can always get the lock open. From there you should get a hold of a key so that you can always get back into your antique chest. And when you need a locksmith for help, call one.